The Division of Physical and Biological Sciences at UC Santa Cruz has awarded its highest honor, the Outstanding Faculty Award, to Anthony Fink, professor of chemistry and biochemistry. "Dr. Fink is a distinguished scientist who is held in high regard for his excellence in research, teaching, and service. He is truly an important asset to our campus," said Stephen Thorsett, dean of physical and biological sciences, in a statement announcing the award. Fink's 40-year career in academia has been studded with landmark contributions to the field of biophysical chemistry. With more than 200 scientific publications, 20 book chapters, and three books, he is a world authority on protein folding. Mistakes in this molecular process lead to degenerative diseases such as Parkinson's, Alzheimer's, and bovine spongiform encephalopathy, or mad-cow disease. Fink's research aims to understand what goes wrong and to design treatments that can repair the damage or prevent it from happening. "Dr. Fink is renowned for his contributions to the understanding of the molecular basis of enzyme mechanisms, protein folding, molecular chaperones, and diseases involving protein aggregation and deposition," the award notice stated. 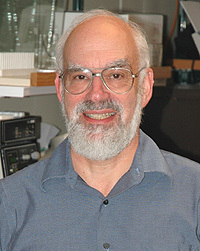 Fink joined the UCSC faculty in 1969, one year after he finished his Ph.D. in chemistry at Queen's University, Canada. During his long tenure here, Fink has spent several sabbaticals and visiting fellowships at Brandeis University and at Oxford and Cambridge universities in England. Since 1999, he has also participated as a senior scientist in research at the Parkinson's Institute in Sunnyvale. Fink is known for cultivating a cohesive research atmosphere in his lab, coordinating group potluck dinners, bike rides, and camping trips. He has advised more than 60 graduate students, 50 postdoctoral fellows, and hundreds of undergraduates. He has also frequently opened his lab to visiting undergraduates in summer research programs and to sabbatical visitors from around the world. In 2002, Fink won the BioSTAR outreach ambassador of the year award and in 2004 was elected a Fellow of the American Association for the Advancement of Science, the world's largest professional scientific organization. He is also an accomplished fine-art photographer who has exhibited his work in Santa Cruz County's Open Studios. In May, a symposium held on campus in Fink's honor brought together colleagues and former students from across the United States, Japan, Mexico, and South America.